Melbourne-based NH Architecture and Seattle architectural practice Olson Kundig placed first and second respectively in the 2018 Land Art Generator Initiative design competition in Melbourne, Australia. Sponsored by the State of Victoria’s Renewable Energy Action Plan with clean energy targets of 25 percent by 2020, the international competition sought large-scale works of public art that generate renewable energy in visible ways for St. Kilda Triangle in the City of Port Phillip. NH Architecture’s winning proposal, named ‘Light Up,’ harnesses solar, wind and microbial fuel cell technologies to produce 2,200 MWh of energy annually — enough to power nearly 500 homes. 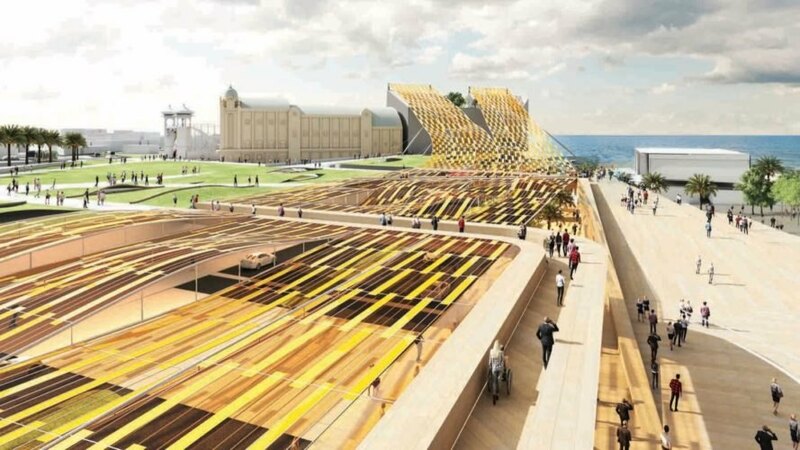 NH Architecture’s winning Light Up proposal consists of a lightweight tensile shade structure topped with 8,600 efficient, flexible solar photovoltaic panels envisioned over Jacka Boulevard. 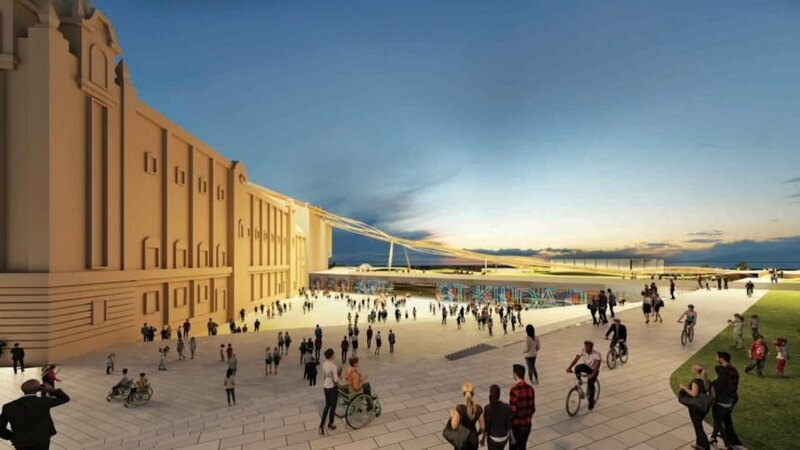 Designed with the aim of “maximizing the public realm” without compromising views, the design makes use of tested components available on the market. The clean energy power plant was also designed to harness wind energy and uses microbial fuel cells to tap into energy from plant roots. Olson Kundig’s second-place submission ‘Night & Day’ also taps into the power of solar with 5,400 square meters of solar panels. The solar system is combined with two Pelton turbines and a hydro battery to operate 24 hours a day and produce 1,000 MWh annually. As an ideas competition, LAGI 2018 has no plans of realizing the winning submissions. The Light Up team will receive $16,000 in prize money while the runners-up will receive $5,000. Light Up, a renewable energy proposal by NH Architecture, has won this year's LAGI design competition in Melbourne. The design utilizes solar, wind and microbial fuel cell technologies to produce clean, renewable energy. 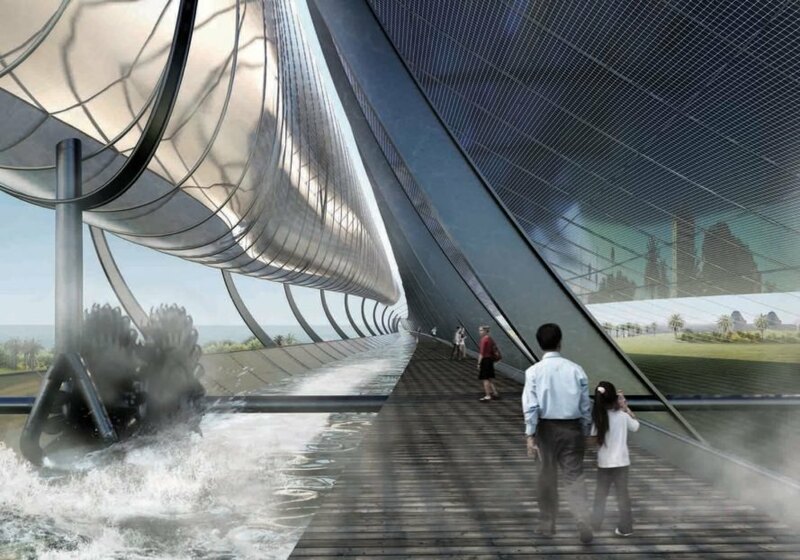 The visually appealing structure would power nearly 500 homes. The second place proposal by Olson Kundig would use renewable energy to power up to 200 homes. Night & Day also incorporates energy storage solutions. The curved solar sail would be topped with 5,400 square meters of solar panels. The Light Up team has won $16,000 for the design. Runners-up won $5,000.